Pasta and sauce is my little girl’s favorite meal. I make a homemade tomato sauce every 3-4 months and freeze it for pasta and soups. While I try to feed her as much of the food that we’re eating, I do go out of my way and make a separate tomato sauce for her. I do this because I mix in a lot of other vegetables in her tomato sauce to ensure that she’s getting more nutrients just in case she decides that’s the only thing she’s going to eat all day. If you’re going to follow this recipe, feel free to play with the amounts of the various ingredients and add or take away any that you don’t have/want. I try to add as many immune-boosting ingredients (olive oil, flaxseed oil, onion, garlic, basil, thyme, and oregano) to the sauce as I can. I steam a lot of the vegetables before pureeing them together in the pot. Don’t over steam your vegetables! Most vegetables lose valuable nutrition the longer they’re steamed, so keep the steaming at a minimum. 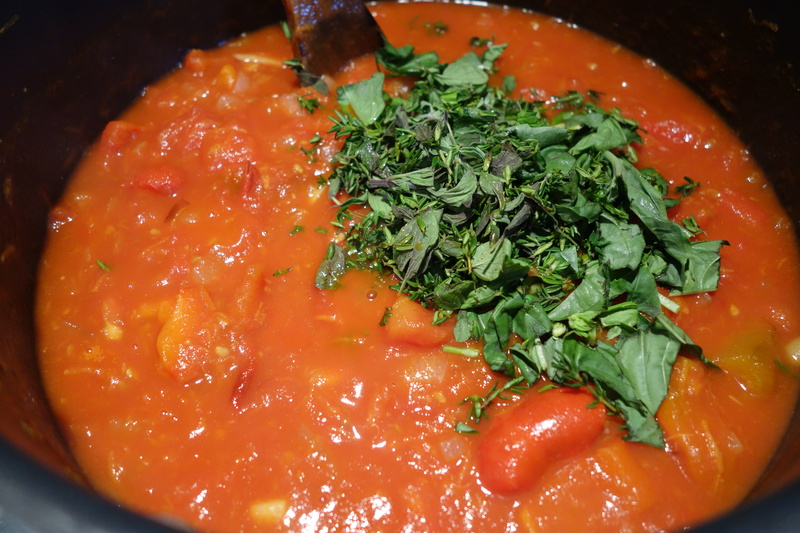 Just like any other tomato sauce, this vegetable sauce keeps great in the freezer. I make a pot full of sauce and it’ll last me for about a month or so. When I’m ready to serve the sauce I defrost it and mix it in with either pasta, or potatoes. If I give Cella pasta I try to go with the springs because I feel like they hold more sauce than the other types of pasta, and it’s the sauce that I want her to eat more of. This sauce isn’t only good with pasta, it’s also very yummy with some crushed potatoes. Cella has several teeth and can chew pretty much anything with them so I’ll just boil some potatoes, mash them with a fork, and mix them with the sauce (another of Cella’s favorite dishes). 1. Cut your red bell pepper into 3-4 long, wide pieces. Lightly rub olive oil over the bell pepper, place the bell pepper skin up on a baking sheet, and broil the pepper at 450° F for 20-30 minutes. 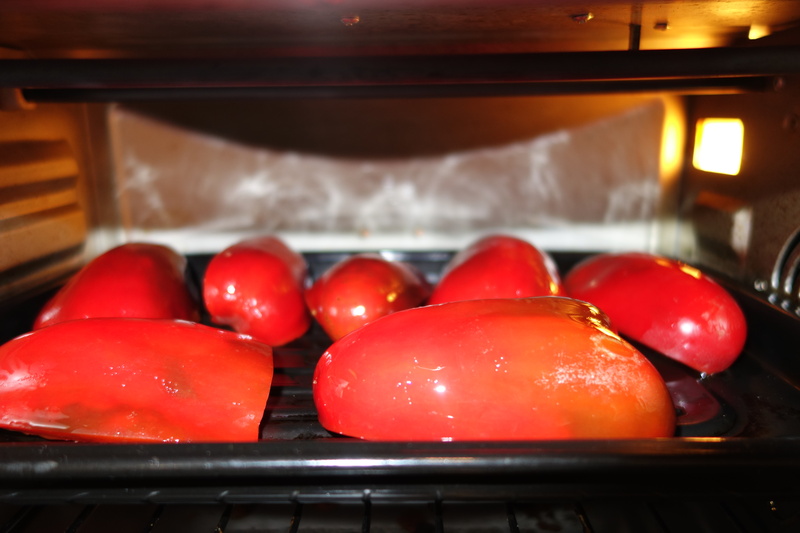 Remove any blackened skin from the red pepper once it’s done broiling and set aside. 2. 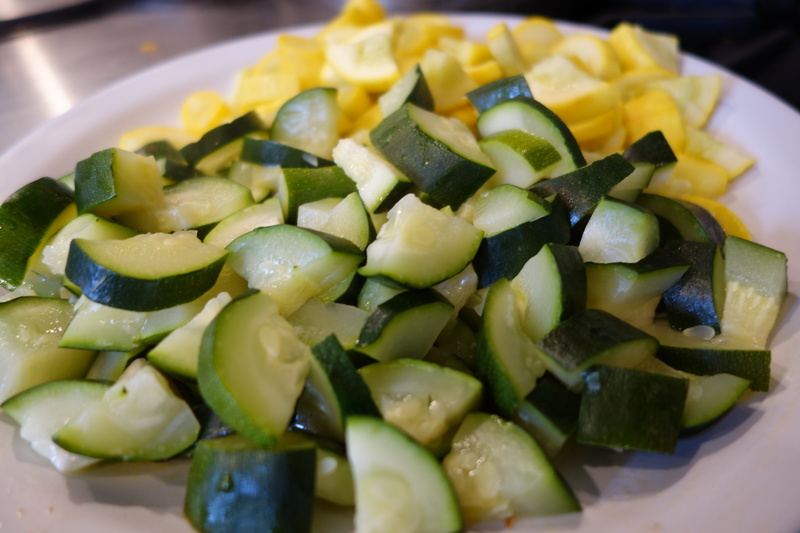 Roughly cut the yellow squash and zucchini and lightly steam it. Set the squash and zucchini aside. 3. In a large pot, saute the onion with some olive oil an flaxseed oil (optional). I add flaxseed oil to baby food whenever I use olive oil. Omega-6 fatty acids are found in far more foods than omega-3 fatty acids. Flaxseed oil contains more omega-3 fatty acids than anything else I could find. Flaxseed oil does have a weird taste, so I’ll use it whenever I can get away with it. Using it in foods that have strong flavors, like a tomato sauce, is a no-brainer for me. 4. Add the grated carrots to the sauteing onion in the pot after a few minutes. Add a little more oil if you need to keep things from burning. Once the carrot has sauteed for a few minutes, add the sliced garlic to the pot and continue to saute for another 2-5 minutes. 5. 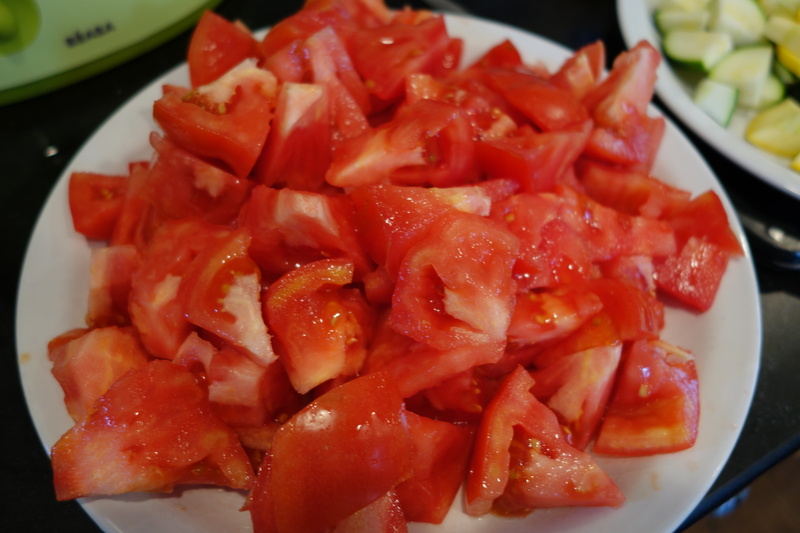 Roughly chop your tomatoes. I keep the skin on because I will eventually puree the entire pot. 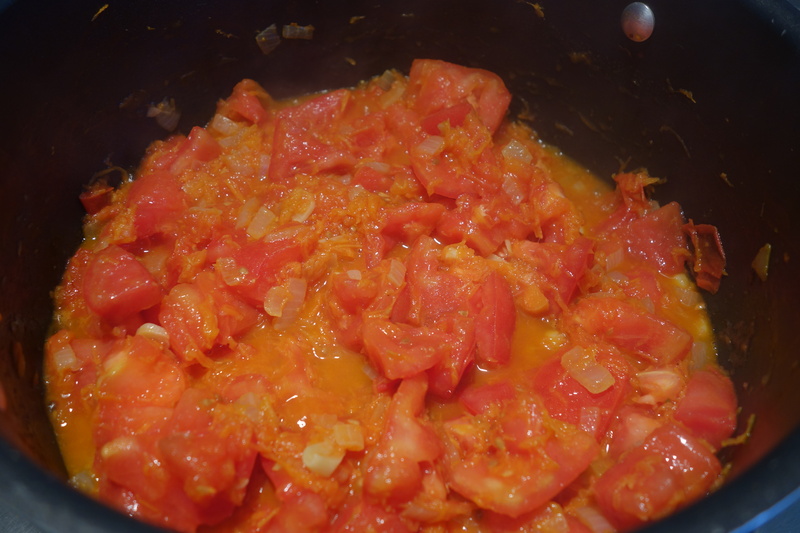 Add the tomato chunks to the pot, mix thoroughly, cover your pot, and allow everything to reach a simmer so the tomatoes can begin breaking down. Simmer for about 10-20 minutes, stirring every once in a while, until the tomatoes become very mushy. Add the 12 oz of tomato paste to the pot, mix thoroughly, and add a little water if things look too thick (Don’t add too much water at this point, you still have that juicy squash and zucchini to add.). 6. Once you mix the tomato paste into the sauce go ahead and add the herbs, broiled pepper, squash, and zucchini to the pot as well. Mix well. 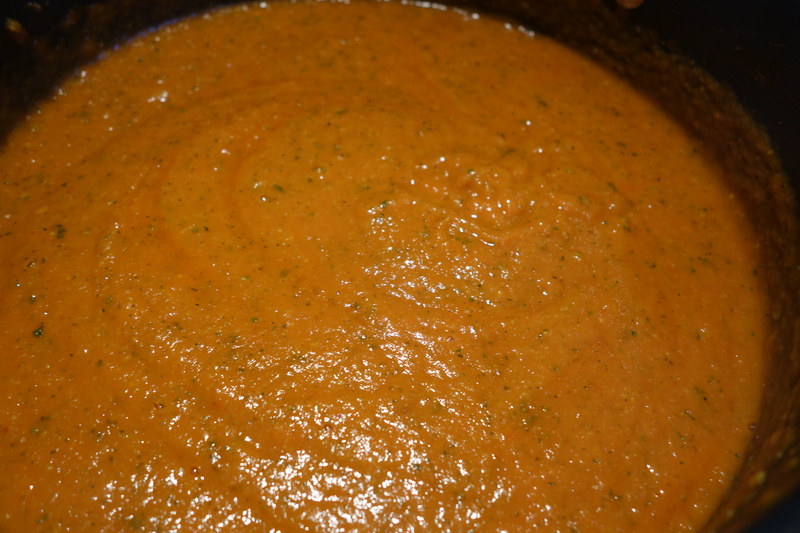 Using a hand blender, puree all the veggies right in the pot (A regular blender will do just as good a job, I just hate the idea of pouring scalding hot sauce back and forth between pots and blenders.). Add a pinch of sugar and salt to taste once your sauce is pureed. This entry was posted on March 26, 2014 by natalyaperullo in Baby.